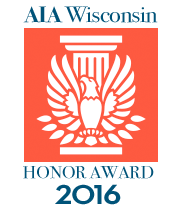 Ramsey Jones Architects receives 2016 AIA Wisconsin Honor Award for Lake Michigan Beach Cottage – Belgium, WI. Milwaukee’s Coolest Offices: Developer Juli Kaufmann’s home office stands out: Developer Juli Kaufmann’s Shorewood home is much more than just her residence. It also serves as her office for her growing development firm, complete with a green roof and renewable energy sources. Every step of the way, it was built with sustainability in mind, from its orientation on the lot (facing south, with a vast expanse of sliding glass doors maximizing sunlight to heat and light the house) to reuse of materials, including bricks from city streets, wood from pickling barrels and fallen trees.They built a team to make that happen. Patrick Jones of Ramsey Jones Architects, with experience in sustainable housing, designed the 1,780-square foot home. Stephen Servais of Common Advantage was the builder. Rosheen Styczinski of New Eden Landscape Architecture designed an outdoor environment that captures all rainwater by incorporating native plantings, green roofs, rain gardens, rain barrels and a water cistern. “Many people think of green or sustainable architecture in terms of technologies or expensive systems,” says architect and homeowner Patrick Jones… “But we don’t regard sustainable design as an optional decision; it’s an umbrella principle that covers everything.” Patrick, together with his wife and fellow architect Alex Ramsey, has created a living space that functions as both an artistic mission statement and a thoroughly enjoyable family home in Riverwest. The couple bought a corner lot in Riverwest, affording them great southern exposure. Self-described minimalists, they envisioned a home that made sense for the way people live now: living spaces that flowed together, using materials that were beautiful (in a minimalist kind of way), functional and smart. That meant heavy masonry construction – insulated concrete blocks and a concrete slab floor with radiant heat. The concrete slab absorbs heat during the day and releases it at night, when it’s cooler. Walls were designed to be exactly one sheet of drywall in height (no cutting, no waste). The narrow building with windows on two or more sides of each room means the home is illuminated with daylight as much as possible. They reclaimed and reused whenever they could. The building that stood on the site, the old Wright Street Theater, was demolished, and its remains were “pushed into its own basement” to serve as fill, Jones says. Every room in the house, including the children’s bedroom, has at least two windows, ensuring that the residence is well-illuminated. The hotel also makes no bones about being pro-bike. The large, sharply angled entry canopy is echoed in a ring of parking shelters for motorcycles out front, so all can admire the “iron horses” on display. Even though the hotel is named Iron Horse, it will not be motorcycle-themed, said Dixon. The hotel’s interior will capture the American industrial era with beam construction, exposed brick and iron details preserved from the original structure. There will be few alterations to the exterior beyond adding a canopy on the south and west sides.